Indonesia has decided to renegotiate joint development of a fighter jet with Korea citing straitened circumstances. 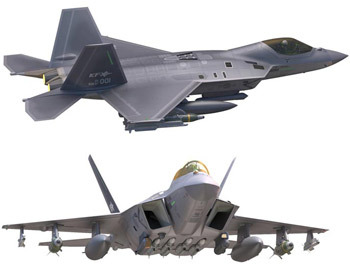 Jakarta originally pledged to shoulder 20 percent of the W8.5 trillion development cost of the KF-X fighter jet using Korean designs and technology by 2026 (US$1=W1,133). The decision would delay the project, dealing a blow to Korea Aerospace Industries and other defense companies while complicating the retirement of Korea's aging F-4 and F-5 fighter jets. Indonesia's Coordinating Minister for Political, Legal, and Security Affairs, Wiranto, on Friday told reporters that his government decided to renegotiate its share in the project. Wiranto said the decision came from President Joko Widodo. Indonesia was to shoulder 20 percent of the development cost in return for one prototype of the fighter jet and the blueprints, as well as some 50 of the aircraft to be manufactured there. But it failed to pay its portion of W238 billion for the second half of last year and the first half of this year. Thomas Lembong, the head of the Indonesia Investment Coordinating Board, said the Korean government "understands" Jakarta's difficult position and that President Moon Jae-in agreed with the renegotiations during Widodo's visit to Korea in early September. Lembong added that the two sides agreed to wrap up the renegotiations within a year. The project was slated for completion in the first half of 2026, and 120 of the aircraft were to be built. The entire price tag for the project stands at W18 trillion.